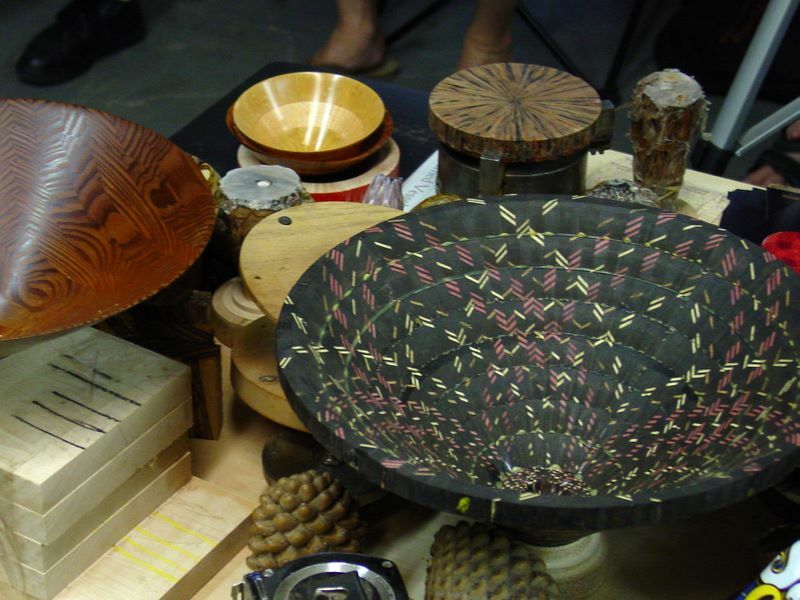 Our summer garden get–together and potluck dinner will be at the Rinde’s house on July 18th. Please RSVP to Barbara Turner at samturner@aol.com or 805-643-3597 and let Barbara know what you are bringing, either an appetizer, a salad, a main dish, a desert, or bread/rolls. Don’t forget to bring your show-and-tell project. Parking is limited, so carpooling is encouraged. 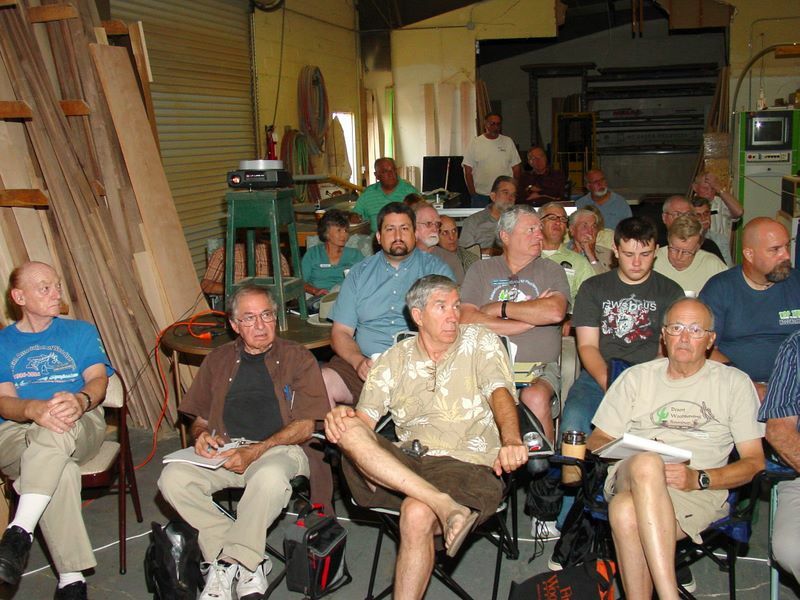 The Board is looking for a Program Chairperson for 2010. Joe Levy has done a great job these past two years but is stepping aside at the end of this year. The sooner we can get this position filled the better because the good demonstrators’ schedules for next year will be filling up. Let me or another Board member know if you are interested in this important role for the Club. 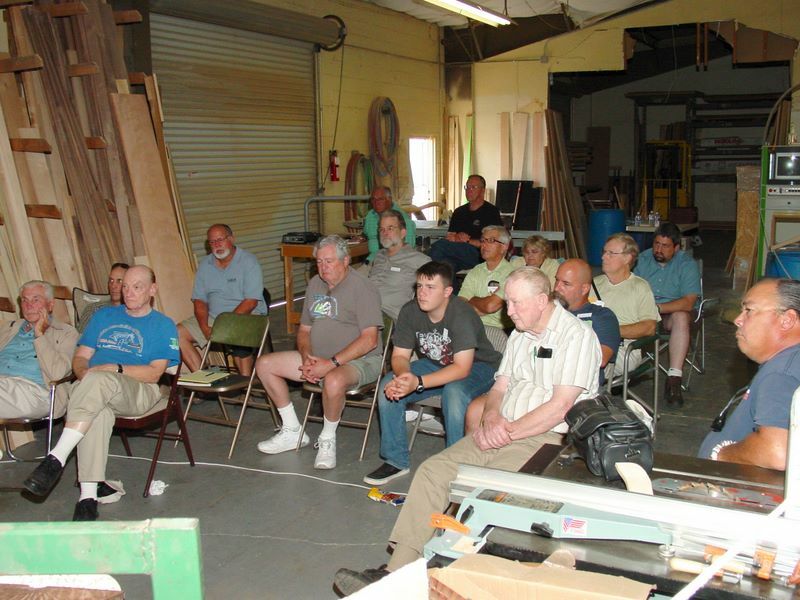 An e-mail went out to the club membership from Al Gellar with details about the club’s participation in the Fair. A sign-up sheet for volunteering in the club demo booth was attached. Sign up soon so you can get the day you want, and finish your projects you want to enter in any of the 12 categories of woodturning. 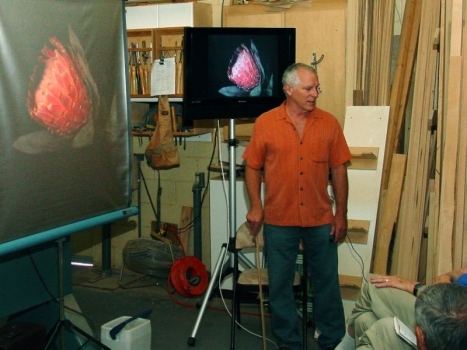 Stephen Case-Pall has located a possible venue for a Club Art Show. It is located at Peace Lutheran Church in Camarillo. It is a converted parsonage house called the Proverbs House. 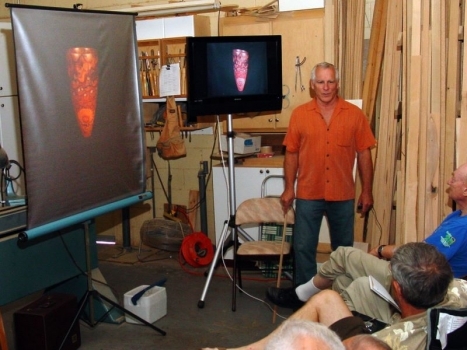 They host art shows there every month or so. We would be looking at a Jan – Feb 2010 time frame. If you would like to do the write-up for the upcoming Mike Shuler all-day demo on the 25th, please call me to let me know. 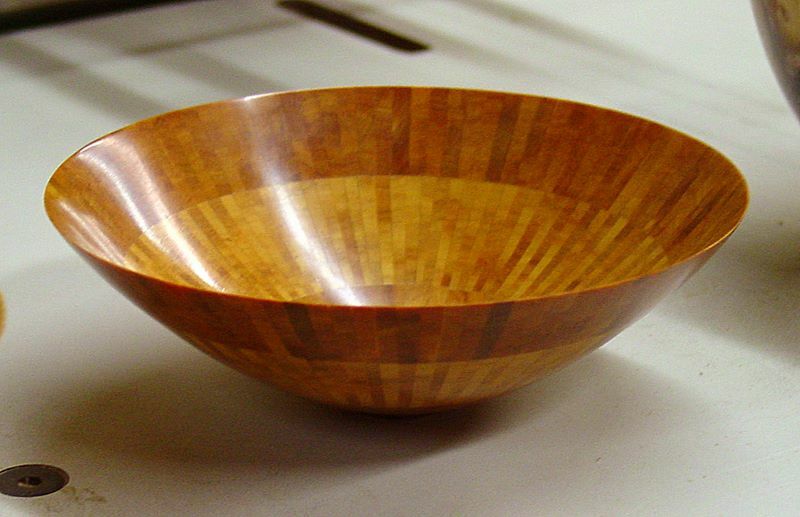 Except for base section, the bowl is made from 104 wedges cut on table saw from 0.75 lumber that is flattened to approximately 0.625”. That makes the wedge’s included angle about 3.45 degrees. 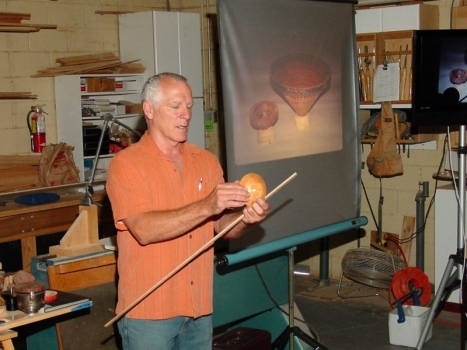 If the diameter is 12”, the circumference would be 37.7”, so the base of each wedge would be about 0.36”. The length is less than 6” (5.25”) because the wood is cut approximately cross grain, so the wedge has very little strength when thin. 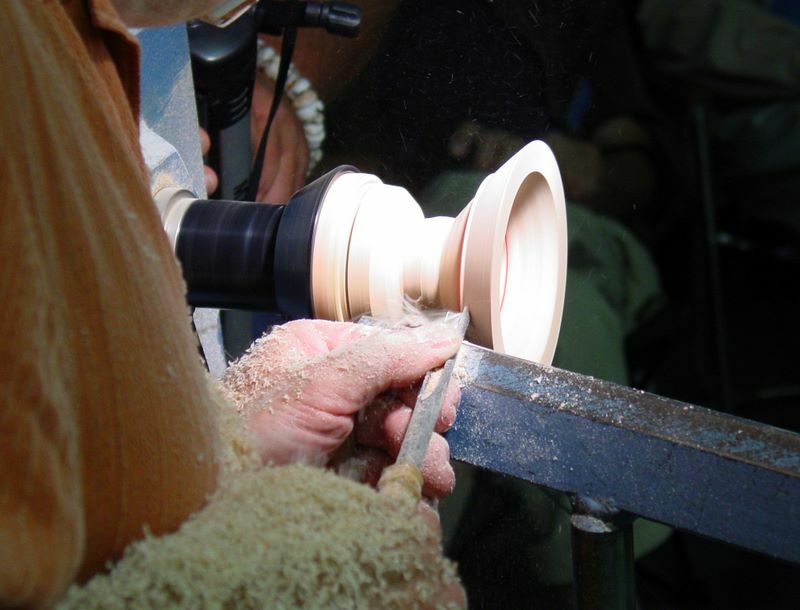 This will leave a hole at the base of the bowl that must be filled with a separate piece or assembly. 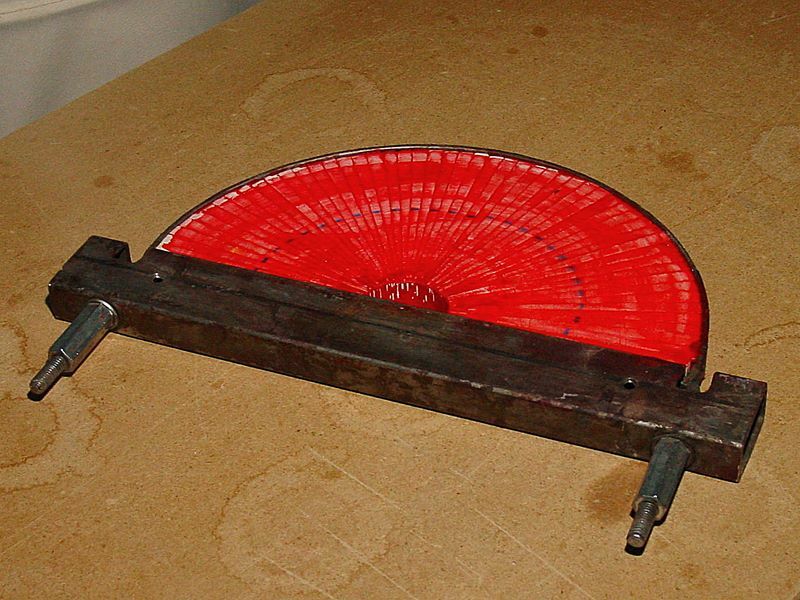 It is important that the saw cuts are accurate, straight, and smooth. Mike does not sand the wedges after cutting on the table saw. He recommends the Everlast brand as being accurate (within 0.002” runout). He uses 10” thin blades with stabilizers to get as smooth a cut as possible. 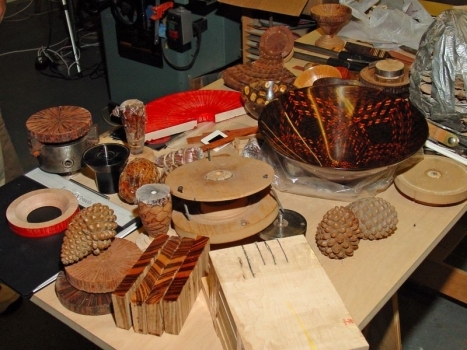 He uses freshly sharpened and clean blades when cutting the segments. The blade he uses is the Everlast TK1080A 80-tooth, 0.102” kerf, 10”, available from www.carbide.com in Ventura for $106.67 including tax and shipping. He uses a sliding table to cut pieces on the table saw (see photos). 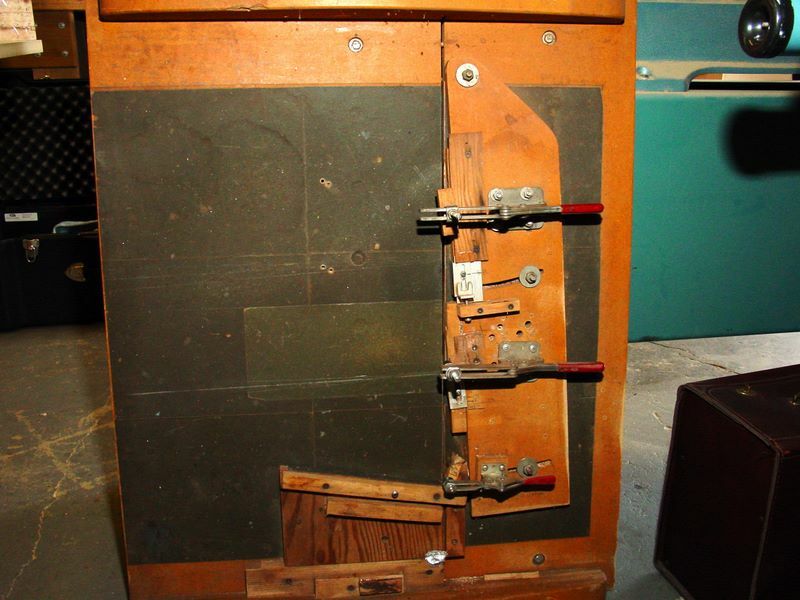 The table has no slop on the runners, the surface is coated with 400-grit sandpaper to prevent slippage, and he uses hold-down clamps. The wedges are cut against a stop with both sides of the cut clamped. He flips the supply piece over after each cut. 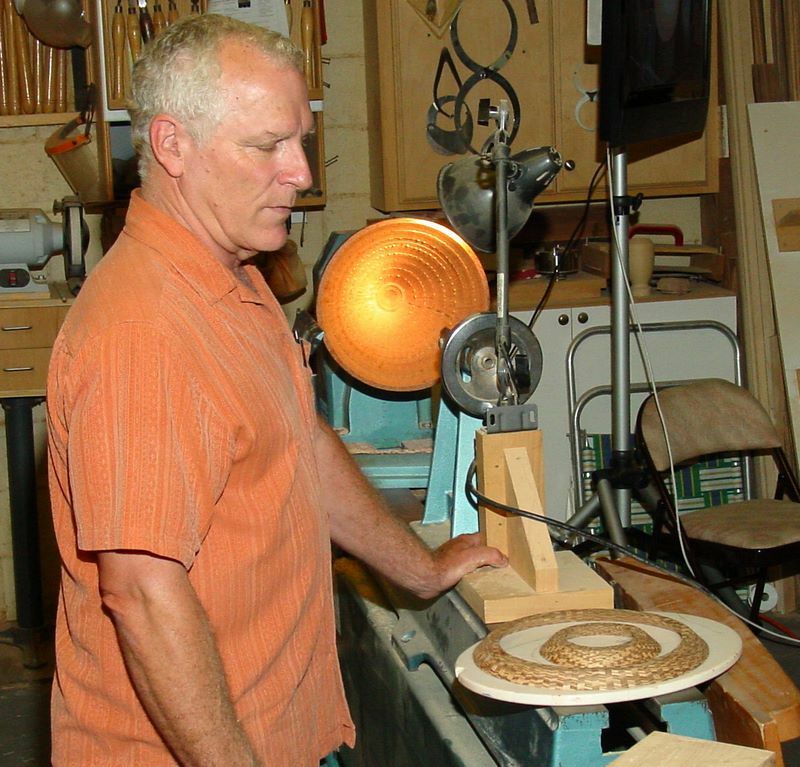 He stacks the pieces in a ring sequentially as he goes. 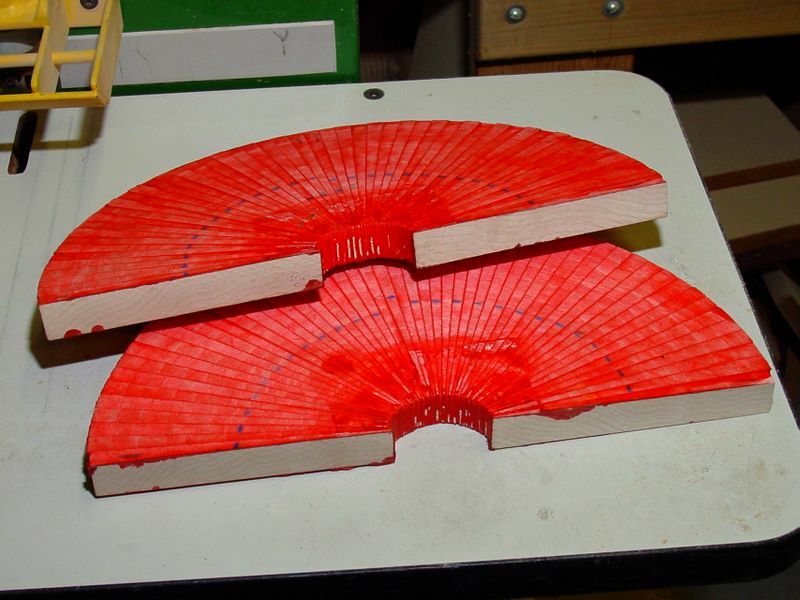 The wedges are dry fit in a complete circle to verify the fit is accurate. 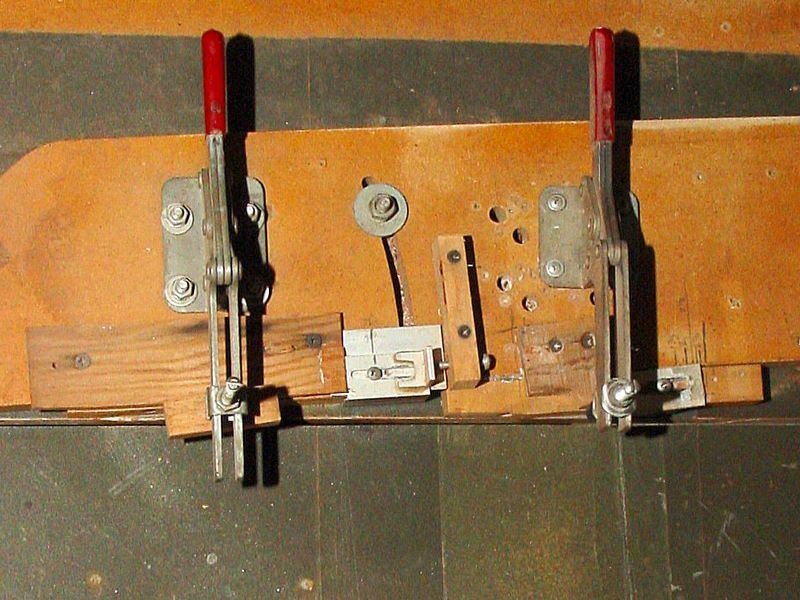 If acceptable, he glues up two semi-circles in a D-shaped band clamp using Titebond I (slow set) wood glue. The clamp is progressively tightened if the alignment is correct. 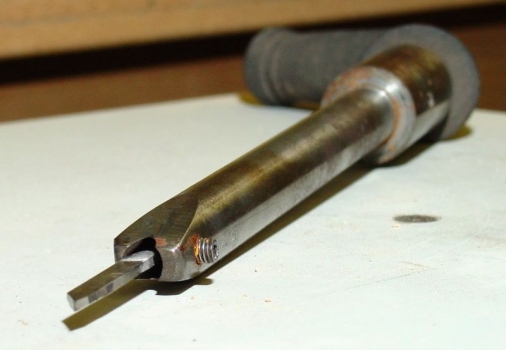 He uses a 1x 1/8” steel strap welded to 3/8” threaded rod. He uses the extra long coupler nuts for strength. The semicircles are flattened and surfaced as required. 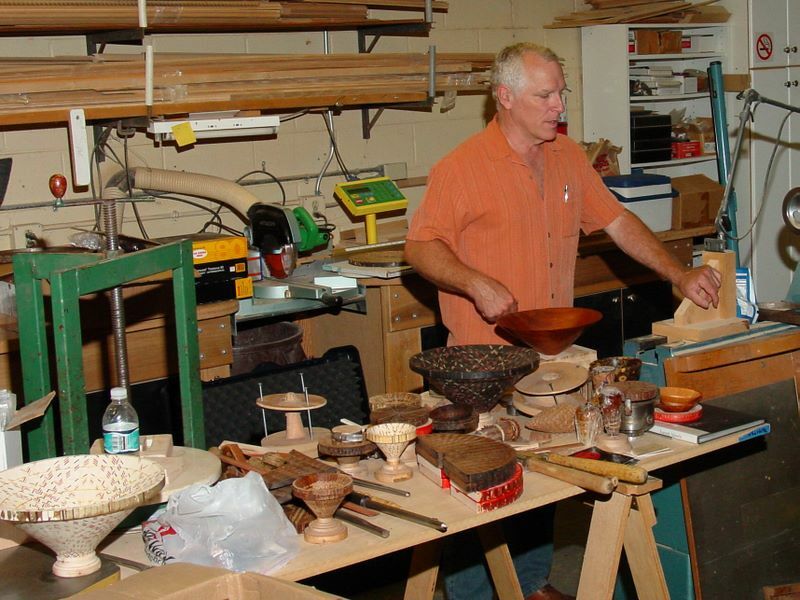 He uses an overhead router frame to flatten boards and glue-ups. 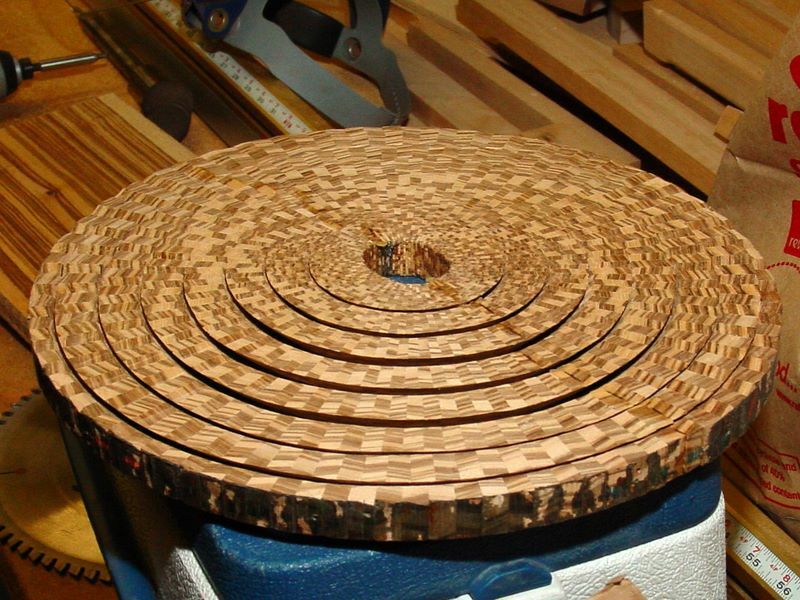 The mating surface of each semicircle glue-up is flattened on the 14” disk sander table. 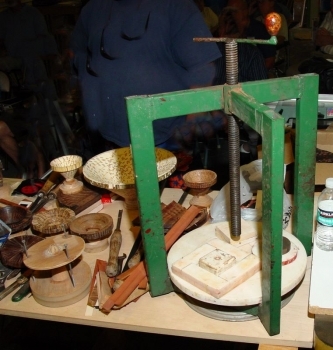 Temporarily assembled in a circle, the 7-8 rings are laid out with a compass. 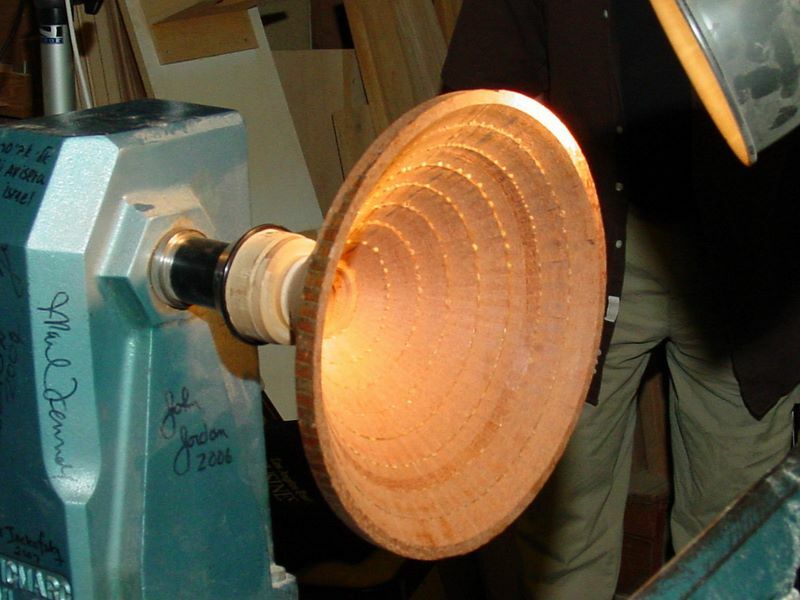 Each half-disk is then cut into rings on the band saw at about a 45-degree angle (see photo). The half rings are trued up top and bottom by rubbing on a flat sanding surface, such as sandpaper glued to MDF or Corian. He glues the two parts of each set together with finger pressure and mounted on flat surface like Corian (see photo). 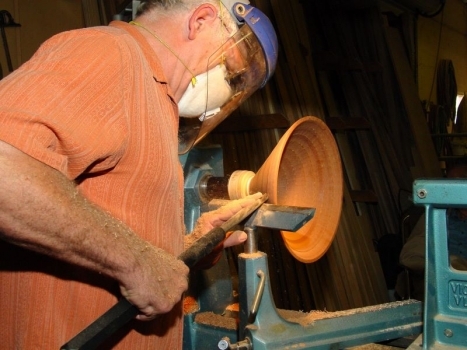 The rings can also be cut from a solid disk – either solid wood or segmented – on the lathe using a thin parting tool. Mike used a cutting tool mounted in a Stuart system handle (see photo). He then assembles the bowl stack of rings gluing up two rings at a time. 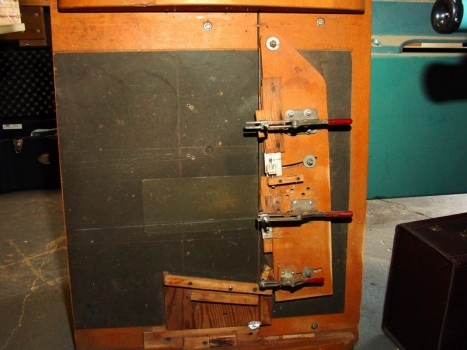 He clamps the assembly in a screw press made with a frame of 1×2” box channel steel and a 1” Acme thread rod (see photo). He uses a Corian base plate shimmed up to be square with the screw axis. 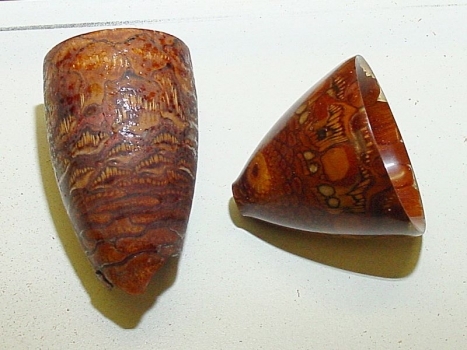 The base section is made of wedges that are ripped rather than crosscut. 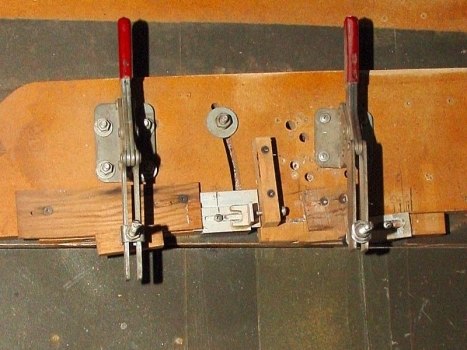 These are glued up with a band clamp. 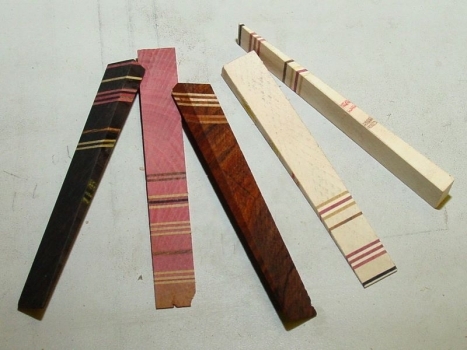 He cuts the wedges from lumber with a strong figure such as Zebrawood, Cocobolo, or Bocote, or else with a plain light or plain dark wood such as Holly or Gabon Ebony with included strips of colored wood (see photo). 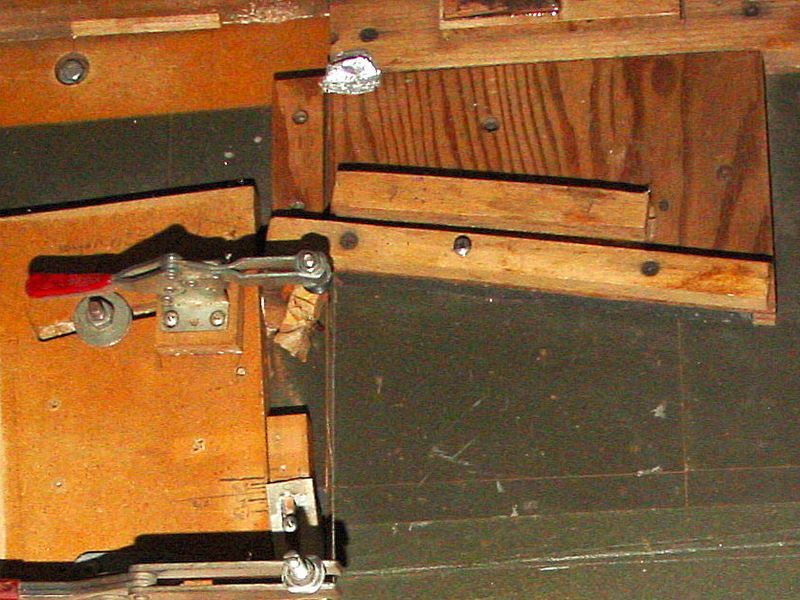 The inserts are ripped on the table saw about 1/16” thick. The base material is cut on an angle and then reassembled with the thick veneers included. 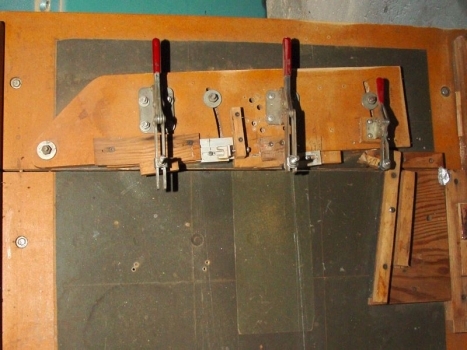 The glued up assembly is trued up in the leveling router jig described above. 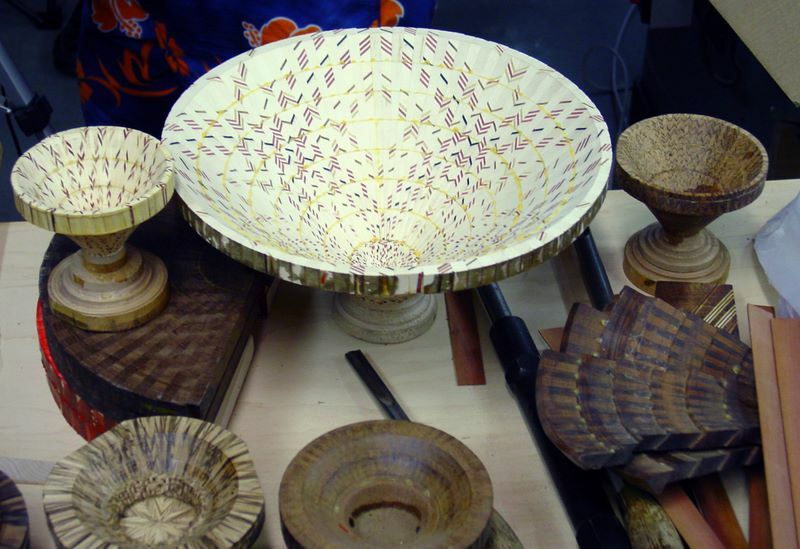 He makes four boards with the inlay inserts, one board for each bowl quadrant. He also has one long board of base material without the inserts. 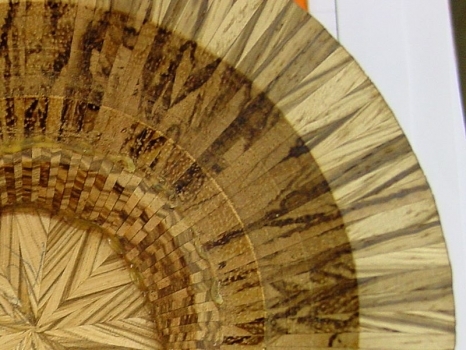 After all the material is cut into wedges, he selects segments of base material with veneer and intermixes non-veneer base material to create patterns. 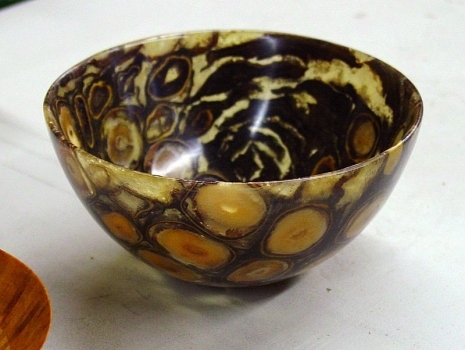 The resulting “flower” patterns divide the bowl into four quadrants. 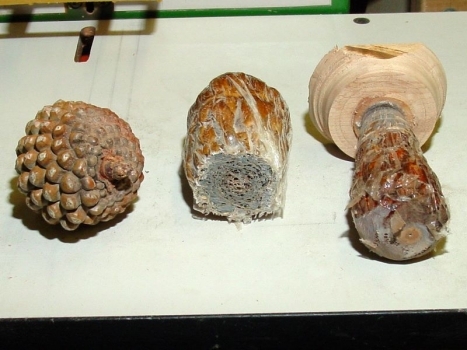 Mike is also known for his turning of pinecones impregnated with epoxy. He also uses Banksia pods and flowers and Protea flowers. 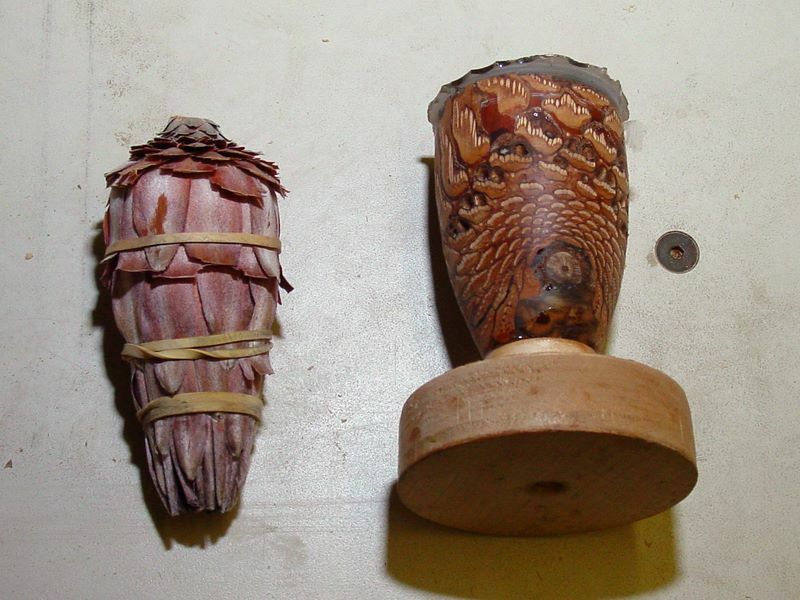 The flowers are first freeze dried, then tied closed and epoxy soaked. He also uses CA glue. He has also turned large (10”) Bunya Bunya cones into a bowl shape (see photo). 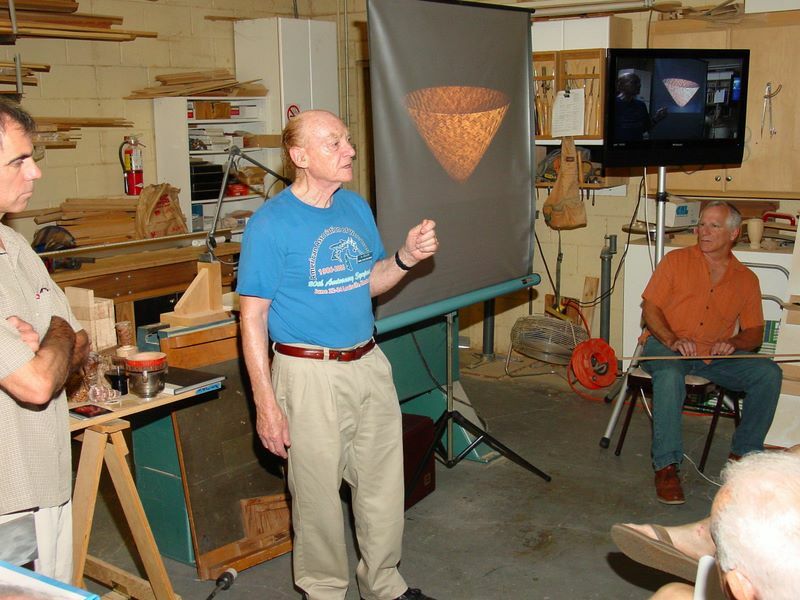 Mike showed us small bowls made in three rings. He has also turned some very thin – approximately 0.030” thick. He coats the surfaces with thin CA glue for strength and finishes with spray lacquer. 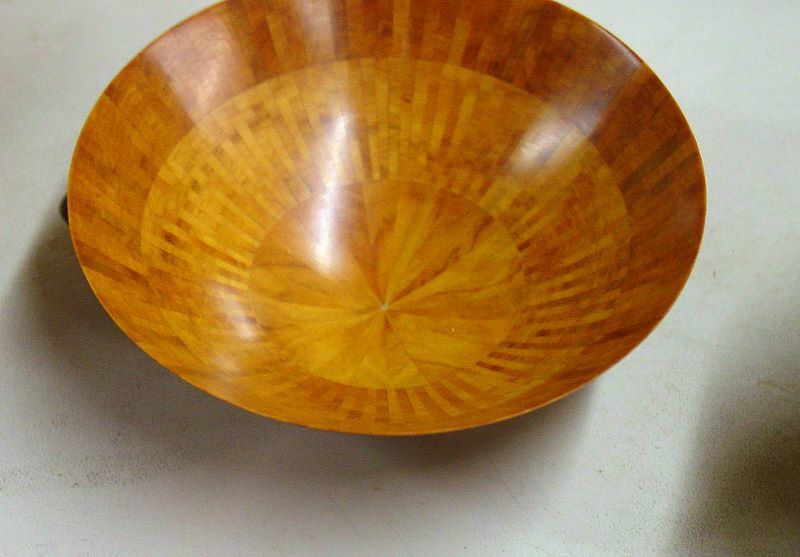 This is the same finish he uses for the 12” bowls also. 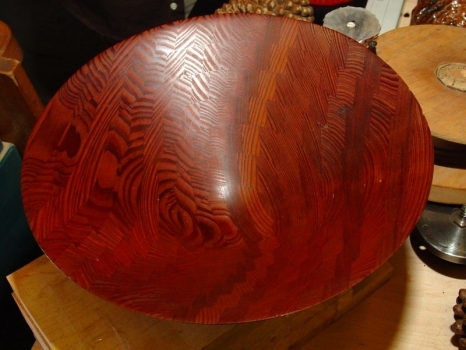 Mike developed his basic techniques using a Redwood bowl project. 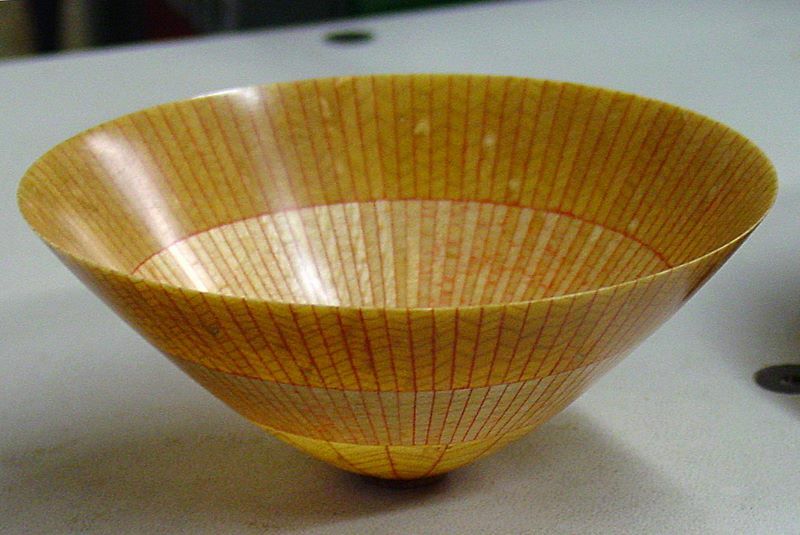 He wanted assurance that a thin, segmented bowl would hold together. This project did not use wedges, but used strips of wood glued into the two half sections before they were cut into rings as described above (see photo). 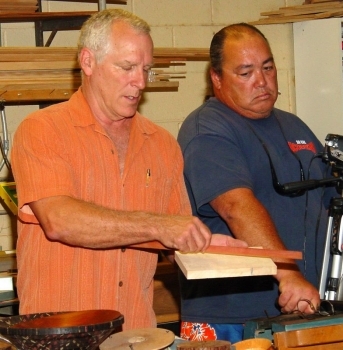 Another reference is Mike’s article called “Segmented Turning” in the May/June 1989 issue of Fine Woodworking Magazine. Contact Ron Lindsay if you would like to see a copy.